• When installed on a live system, invisible laser radiation may be present. Do not stare into connector end face or view directly with optical instruments. • Wear safety glasses when working with optical fiber. • Dispose of all scrap fibers to avoid getting fiber slivers. For a proper cable installation, it is important to understand the cable specifications. The two most important specifications are tensile loading and bend radius. It is very important to adhere to these limits. Whenever possible, the tension on the cable being installed should be monitored. Tension can be measured with a dynamometer or with a pulling wheel. Breakaway pulling eyes that separate if the tension reaches a preset level are available. The use of a swivel is recommended when pulling the cable in a tray. The swivel allows the cable and pulling rope to twist independently. If a run is too long, or if several bends are in the conduit, intermediate pull boxes should be used to separate one long pull into two or more shorter pulls. A cable should not be pulled through more than two 90º bends at one time. 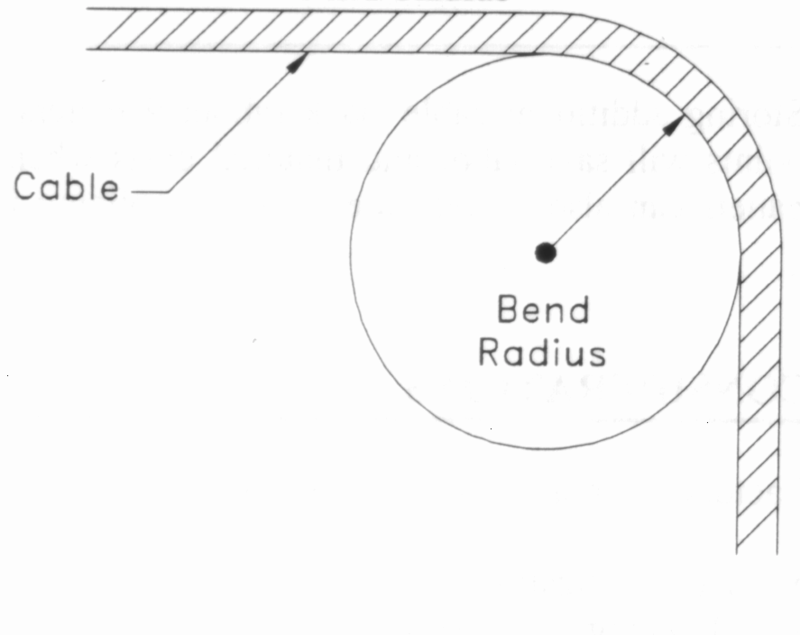 If three or more 90º bends in a continuous run are unavoidable, the cable should be installed from a central point, unreeled into a figure-eight, and then backfed to complete the installation. Sharp bends may increase cable tension, so it is best to install cable in sequences that minimize stress and labor costs. When running cable vertically, take note of the cable weight. Install cables in a sequence that applies the least amount of strain to the cable. For example, most vertical chasers in buildings tend to be congested at the lower floors; instead, try to start your installation at the top and work down the building, thereby eliminating most of the cable installation by the time you reach the lower floors. After installation, the strength member of the cable will need to support the hanging cable. If a long vertical run is necessary, cable should be secured at each floor and service loops should be placed every three floors, at a minimum. This procedure will help distribute the weight of the cable vertically and will facilitate moves, adds and changes (MACs) if needed at a later date. • The short-term minimum bend radius, or dynamic bend radius, is the tightest recommended bend while installing cable at the maximum rated tension. It is the larger of the two specified bend radii. 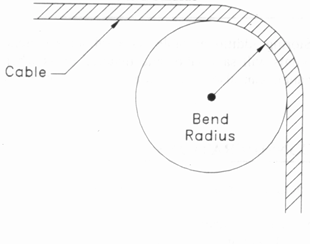 Throughout the pull, the minimum bend radius must be strictly followed. If a location exists in the middle of a run where a relatively tight bend is unavoidable, the cable should be hand-fed around the bend or a pulley can be used. • The long-term bend radius, or static bend radius, is the tightest recommended bend while the cable is under a minimum tension. It is the smaller of the two specified bend radii. After the pull is complete, the cable can be bent more tightly to fit into existing space, but not to exceed the long-term minimum bend radius. Always follow the manufacturer’s guidelines for minimum bend radius and tension. Failure to do so may result in high attenuation (macrobends) and possible damage to the cable and fiber. Guidelines are normally supplied with the cable manufacturer’s specification sheets. If the bend radius specifications are unknown, the de facto standard is to maintain a minimum radius of 20x the diameter of the cable. For cables using aramid yarn alone as the strength member, the jacket can be removed to expose theyarn. The yarn should be tied in a knot with the pull rope, so that the jacket will not be inadvertently used for strength. Optionally, the jacket can be tied into a tight knot before pulling. After pulling, the knot should be cut off. For cables using aramid yarn and an e-glass central member, a pulling grip should be used. The strength member(s) should be attached independently. This can be accomplished by weaving the strength member into the fingers of the grip, and then taping it together. All strength members should be gripped equally to ensure proper distribution of tension. Factory pre-terminated fiber optic cable assemblies may be specified in project environments such as data centers. The assemblies can be ordered in either indoor (plenum) or outdoor versions, with different fiber counts, and in multimode or singlemode. A pulling eye can be factory installed on either end or on both ends of the cable. The pulling eye (and associated cable netting) will protect the pre-terminated ends during the pull. This product is a great time saver and ensures quality connections every time. The use of pulling eyes (and associated cable netting) is highly recommended. Pulling eyes facilitate installation and protect the pre-terminated ends during the pull. In many cases, pulling is not done from point to point, but rather from an intermediate point, pulling in each direction to each termination location. In these cases it is important to make sure that the cable is ordered with two pulling eyes, one at each end. The installation of a cable that is pre-connectorized on both ends requires special raceway considerations and pulling grips. A typical fiber optic connector is 0.5 in. (1.25 cm) in diameter, has a limited pull-off rating and must be protected during cable placement. A pulling grip for a pre-connectorized cable must successfully isolate the connectors from any tensile load by placing the load on the cable itself. The pulling grip must also protect the connectors from abrasion and damage. In medium fiber-count cables (6 to 24fibers), the connectors must be staggered when installed to reduce the diameter of the pulling grip. In high-fiber-count cables (greater than 24 fibers), installation of a pre-connectorized cable may not be possible due to the conduit size that would be required. Since the MPO connector is pre-terminated by the manufacturer, it is important to be precise when measuring the length of the ribbon cable required, and to always add a minimum of 3 to 5 m (10 to 16 ft.) to the total ribbon cable length to plan for unknown difficulties. For very long lengths, adding three percent to the total length is suggested. The minimum conduit diameter needed to pull one ribbon cable assembly equipped with an MPO connector and one pulling eye is ¾ in. (21 mm). Up to 12 ribbon cables can be pulled through a 1-½ in. (41 mm) conduit. All optical fiber cables are tested before leaving our manufacturing plant. Before installing the cable, we recommend testing the cable for continuity while still on the reel. This is to ensure that no damage occurred during shipment. Since the cost of installation is usually higher than the cost of materials, testing the fibers before installation can avoid unnecessary additional expenses and help meet important deadlines. At a minimum, continuity testing can be done on the reel with a visual fault locator or a simple fiber tracer such as a flashlight, a modified flashlight to properly hold the fibers, a microscope or a bright red light (LED lookalike). With one of these simple tests, you should be able to identify broken fibers, if any, within the optical fiber cable. Also, double-checking the actual fiber count and actual cable length is recommended to ensure a proper installation and avoid added costs. It is preferable to use Velcro® wraps instead of tie wraps. Remember not to distort the shape of the cable, as this adds pressure to the optical fibers and may affect performance. Fiber optic cables can be installed in innerducts. The use of innerducts tends to reduce the pulling tension required. Ensure that properly rated innerducts are being installed. A 3 to 6 m (10 to 20 ft.) length of cable slack should be stored in the enclosure or on the wall to allow for repairs and relocation needs. Protect exposed cables from vehicular and pedestrian traffic. For underground installations, pull long cables from the center of the run. Store excess cable in vaults or manholes, and identify optical cables with markers. Use proper hardware that matches cable type, as well as span and tension requirements. Use the correct cable jacket. Identify cable locations with surface markers. Anticipate obstructions. A unique identifier shall be assigned to each backbone cable, which shall be marked on each end. Reference should be made as per the ANSI/TIA/EIA-606-A standard. Before termination, the cable should be properly secured to provide a tension-free length of fiber. When splicing fibers, mechanical or fusion, a splice tray is needed to properly store the completed splices. If connectors are to be used, trays or shelves should be used to support the fiber behind the connector. Proper strain relief sleeves provided with the connectors should always be used to prevent excessive bending of fiber. No shelf is necessary if terminating a breakout style cable with connectors. It is acceptable to directly terminate the 900 μm tight buffer from a distribution cable with a connector, if the above precautions are taken. It can be acceptable to directly terminate the 250 μm coated fiber from a loose buffer tube with a connector in certain applications. However, it is usually recommended to use a breakout kit, which converts a six- or twelve-fiber loose buffer tube to a six- or twelve-fiber 900 μm distribution-style ready for termination. If outside plant cables are used, the gel flooding material needs to be cleaned with the appropriate solvent (please consult the cable manufacturer for recommendation on the choice of solvent). The more thorough the cleaning, the easier the termination procedure will be. To prepare the cable for termination, the outer jacket must be properly stripped. Two ring cuts should be made in the jacket, one about 2 in. (5 cm) from the end and the second at the point where the jacket is to be removed. Care must be taken not to cut all the way through the jacket and into the core. The 2-in. piece is removed from the end of the cable exposing the core and the aramid ripcord. Make a notch in the jacket alongside the ripcord (do not cut the ripcord!). Pull the ripcord with needle-nose pliers, or similar tool, until it reaches the second ring cut. Remove the core from the sliced jacket and pull the jacket to tear it at the ring cut. Once the fiber optic cable is ready for termination, follow the Belden CDT termination installation instructions. Once the cable plant is installed and terminated, it is recommended to test the fiber optic segment. The testing should be done according to TIA TSB-140 and the Acceptance Testing Notes guidelines. These documents provide additional guidelines for field-testing length, loss and polarity of a completed fiber optic link. For all Fiber Express solutions, it is necessary to perform an end-to-end attenuation test to verify the quality of installations and to ensure high quality system performance. The best way to verify whether an end-to-end link meets the link loss budget is to divide the end-to-end link into segments at each crossconnect and measure the attenuation of each link segment. In order for the system to operate properly, the sum of the attenuation for the multiple link segments that form an end-to-end link must be less than the link loss budget calculated in the design phase. For additional information on link loss budget calculations, refer to the Optical Fiber Design Guide. Various types of testing equipment are available on the market, such as an optical loss test set (OLTS), a visual fault locator (VFL) set or an optical time domain reflectometer (OTDR). For troubleshooting, the OTDR is recommended. The OLTS consists of a light source and an optical power meter. The main function of this equipment is to measure the optical power or loss. The VFL is a red laser source; the tracer is an LED source. Either instrument can be used to trace fibers and troubleshoot faults on optical fiber cables. The main function of this equipment is to check continuity of the fiber, as well as to identify fibers and connectors in patch panels or outlets. The OTDR is a more sophisticated measurement instrument. It uses a technology that injects a series of optical pulses into the fiber under test and analyses the light scattering and the light reflection. This allows the instrument to measure the intensity of the return pulse in functions of time and fiber length. The OTDR is used to measure the optical power loss and the fiber length, as well as to locate all faults resulting from fiber breaks, splices or connectors. • Clean all connections and adapters at the optical test points prior to taking measurements, as per ANSI/TIA/EIA-526-14A. • The light source or OTDR (optical time domain reflectometer) used for multimode testing must operate within the ranges: 850 ± 30 nm and 1300 ± 20 nm. • Test jumpers must be of the same fiber core size, performance and connector type as the cable system (e.g. 50/125 μm FX2000 jumpers for a 50/125 μm FX2000 optical fiber system) and shall be one to five meters long. “Method B, One Reference Jumpers” as per ANSI/TIA/EIA-568-B.1 is the recommended test method. Please refer to the Acceptance Testing Notes guideline for details on field testing approaches.